As faculty, Pete loves helping his students grasp and apply new concepts. Having gained field experience in diverse disciplines, he has taught classes on a variety of subjects including literacy, oral tradition and literature, and language survey. Pete loves investing in his students, devoting his time to them both in and outside of class. He especially enjoys watching them grow academically and spiritually. Undoubtedly, Pete’s dedication reveals his passion for his work and his students. Through assorted experiences, God clearly prepared Pete for his position as Dallas International faculty. Dependent on Scripture and undaunted by physical hardship, Pete knew when he was in high school that God was leading him into cross-cultural service. 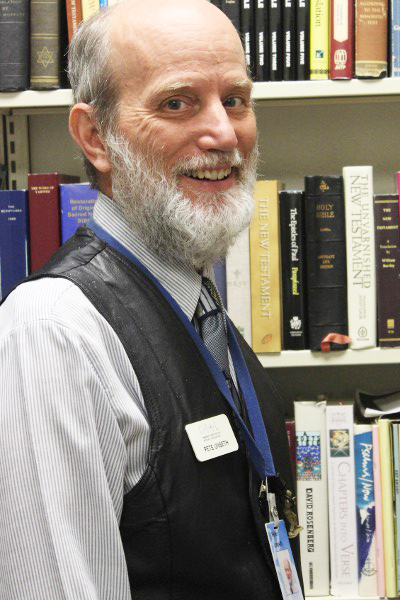 Following his undergraduate studies at Moody Bible Institute and St. Paul Bible College, he completed his Master’s degree in Linguistics at the University of North Dakota. Although initially anticipating serving in Southeast Asia, Pete ultimately accepted an assignment in Ethiopia. In the capital, Pete taught part-time at Addis Ababa University while spending the remainder of his time researching Nilo-Saharan languages. Additionally, he completed survey trips during this teaching assignment. Later, in one of the locations he had surveyed, Pete spent two and a half years conducting translation work and literacy classes in cooperation with the Mekane Yesus Church. Health challenges then prompted his return first to the capital and eventually to the States. After a year of attending to his health needs, Pete began teaching at Dallas International and completed his Doctorate in Linguistics at the University of Texas at Arlington. Drawing from the variety of experiences God has provided him, Pete continues to faithfully and passionately serve the students at Dallas International University. Among Pete’s favorite foods are tibs (an Ethiopian dish) and his wife’s lasagna. His favorite place is where he served with the Majang people in Ethiopia. Pete loves studying proverbs from around the world. He also enjoys studying and working with different writing systems. Dissertation: Biconsonantal reduplication in Amharic and Ethio-Semitic. I worked in Ethiopia from 1982-1995. My work there included teaching linguistics at Addis Ababa University, doing language surveys, organizing courses for mother tongue Bible translators at the Ethiopian Bible Society, linguistic research on Ethiopian languages, leading a language development project (doing literacy, teacher training, and Bible translation) among the Majangir people under the Mekane Yesus Church. I spend a lot of happy time studying proverbs from around the world, and thinking about how to use them in ways that benefit the communities that use them, e.g. promoting public health, education, nation building, building positive values in young (and not so young) people. I am intrigued by how communities choose scripts and spelling systems, sometimes even creating their own script. I am fascinated by the study of the history of Bible translation. There have been some fascinating people involved in Bible translation over the years–everyone from godly pioneers from the far past, to Napoleon’s nephew, to a slave that was rescued by the Italian navy. I have become fascinated by Wikipedia. I have created or edited a number of articles related to my interests–a dangerous, but fascinating, hobby. My wife Carole (queen of Dallas Int’l interlibrary loan) and I enjoy hosting students in our home, such as a weekly Bible study and an Ethiopian feast every semester. So many of my interests revolve around (what I think of as) sociolinguistic themes. I have taught an independent study course on proverbs and also supervised a thesis on the study of proverbs in a language community. How can we use a community’s proverbs in positive forms of language-based development? I have more ideas for proverb research than time. I have written book reviews. A community’s choice of script or creations of a new script involves powerful sociolinguistic factors. Sociolinguistics has much to contribute to Bible translation. For example, I have given two conference papers on the puzzling practice of not using polite forms in Bible translation. So many choices in translation need to be governed by local viewpoints. I still try to understand Ethiopia, topics related to her languages and ethnic groups, especially as related to reading and writing in groups that are now developing literature for the first time. Sociolinguistics is a very broad field. I am interested in such topics as language shift (especially when it results in language endangerment), writing creole languages, and linguistic landscape. In addition, I have had students in a variety of independent study courses: got an idea for one? My academic activities have included a number of areas: Sociolinguistics of scripts, Proverbs, Ethiopia and Ethiopian languages, Translation, Literacy. Many of my publications are listed below under these categories. The categories are not always mutually exclusive. 2011. Invention of scripts in West Africa for ethnic revitalization. In The Success-Failure Continuum in Language and Ethnic Identity Efforts, (Handbook of Language and Ethnic Identity, Volume 2. ), ed. by Joshua A. Fishman and Ofelia García, pp. 23-32. New York: Oxford University Press. 2008. The sociolinguistics of script choice: an introduction. International Journal of the Sociology of Language 192: 1-4. 2008. Missiology and Orthography: The Unique Contribution of Christian Missionaries in Devising New Scripts. Missiology 36.3: 357-371. 2005. Sociolinguistic parallels between choosing scripts and languages. Written Language and Literacy 8.1: 19-42. 2012. Edited with M. Lynn Landweer International Journal of the Sociology of Language, Issue 214 on the theme “Language use in Melanesia”. 2012. with M. Lynn Landweer. An introduction to language use in Melanesia. International Journal of the Sociology of Language 214:1-3. 2007. Horn of Africa, part of the Language section of The American Midwest: An Interpretive Encyclopedia, Richard Sisson, Christian Zacher, Andrew R. L. Cayton, eds., pp. 321,322. Bloomington, IN: Indiana University Press. 2006. Review of Amanda Laugesen, Convict words: Language in early colonial Australia (2003). SIL Electronic Book Reviews 2006-008. Dallas: SIL International. http://www.sil.org/silebr/2006/silebr2006-008. 1997. Disentangling the Two Languages Called “Suri”. Occasional Papers in the Study of Sudanese Languages 7:49-69. 2003. Book notice of Language Contact: an introduction, by Sarah Thomason. Language 79.2:672,673. 2003. Review of Language in South Africa, by Rajend Mesthrie, http://www.linguistlist.org/issues/14/14-1596.html#1. 2001 Review of Language Death, by David Crystal, American Anthropologist 102.4:1187,1188. 2014. Review of Functions and Formal Stylistic Features of Kafa Proverbs. Proverbium 31:49-471. 2013. Using local proverbs. Evangelical Missions Quarterly 49.1: 16-23. 2013. Review of Máakuti t’awá shuultáa: Proverbs finish the problems: Sayings of the Alaaba (Ethiopia). By Gertrud Schneider-Blum. Proverbium 30:459-461. 2012. “I have had maxims and verses flung at me all day”: Proverbs in The Horse and His Boy. CSL: Bulletin of the New York C.S. Lewis Society 43.3:6-9. 2011 Review of Taddese Jaleta Jirata, A Contextual Study of Guji-Oromo Proverbs (2009) and Abdullahi A. Shongolo and Günther Schlee, Boran Proverbs in Their Cultural Context (2007). Proverbium 28: 427-434. 2011 A culture “full of choice apophthegms and useful maxims”: Invented proverbs in C.S. Lewis’ The Horse and His Boy. Proverbium 28: 323-338. 2010. Review of W. Jay Moon, African Proverbs Reveal Christianity in Culture: A Narrative Portrayal of Builsa Proverbs Contextualizing Christianity in Ghana (2009). Missiology 37.3: 355,356. Also a different review for a different audience: 2010. Proverbium 27:407-412. 2008. How to collect 1,000 Proverbs: Field Methods for Eliciting and Collecting Proverbs. Proverbium 25:399-418. 2006. Analyzing and Using Receptor Language Proverb Forms in Translation. The Bible Translator 57.2:79-85 and 57.4:161-170. 2005. Translating Proverbs. The ATA [American Translators Association] Chronicle 34.1:39-42. Entries for Encyclopaedia Aethiopica, edited by Siegbert Uhlig. Wiesbaden: Harrassowitz. Vol. 1 “ALERT” 194,195, “Aster Ganno” (together with Kebbede Hordofa Janko) pp. 387,388, “Bible translation into modern Ethiopian languages” p. 574, “Burree Waaqa” p. 649. Vol. 2 “Dawit Amanu’el”. Vol. 3 “Thomas Lambie” p. 491, “Majangir ethnography” p. 629, Majangir language” p. 627-629, Murle language p. 1076, 1077. 2003. Surveying bi-consonantal reduplication in Semitic. In Selected Comparative-Historical Afrasian Linguistic Studies in Memory of Igor M. Diakonoff ed. by M. Lionel Bender, 257-273. Munich: Lincom Europa. 2002. Biconsonantal reduplication in Amharic and Ethio-Semitic. Dissertation, University of Texas at Arlington. 1999. Hebrew kush: “Sudan”, “Ethiopia”, or what? Africa Journal of Evangelical Theology 18.2:143-159. 1998. Two Old Causative Affixes in Surmic. Surmic Languages and Cultures, ed. by Gerrit Dimmendaal, pp. 113-126. Köln: Köppe. 1998. Notes on Clan, Kinship, and Marriage Patterns Among the Majangir. Surmic Languages and Cultures, ed. by Gerrit Dimmendaal, pp. 145-178. Köln: Köppe. 1998. with Jon Abbink. Cross-ethnic Clan Identities Among Surmic Groups: The Case of the Mela. Surmic Languages and Cultures, ed. by Gerrit Dimmendaal, pp. 103-112. Köln: Köppe. 1998. with Jon Abbink. Surmic Languages and Cultures: A Bibliography. Surmic Languages and Cultures, ed. by Gerrit Dimmendaal, pp. 127-142. Köln: Köppe. 1997. Fitting in with Local Assumptions about Literacy: Some Ethiopian Experiences. Notes on Literacy 23.2:1-14. 1997. An Archaic Surmic Causative Prefix. Occasional Papers in the Study of Sudanese Languages 7:41-48. 1997. With Jon Arensen, Nicky de Jong, Scott Randal. Interrogatives in Surmic Languages and Greenberg’s Universals. Occasional Papers in the Study of Sudanese Languages 7:71-90. 1996. Review of Reminiscences of My Life, by Ammanuel Abraham. Northeast African Studies 3.2 (new series): 157-159. 1995. Review of “Meaza” of Ethiopia, by Kevin O’Mahoney. Northeast African Studies 2.3 (new series): 97,98. 1994. Verbal Negation in Majang. Proceedings of the Eleventh International Conference of Ethiopian Studies, vol. 1, ed. by Bahru Zewde, Richard Pankhurst, Taddese Beyene, 551-567. Addis Ababa: Institute of Ethiopian Studies, Addis Ababa University. 1991. Consonant Sequences and Morphophonemics in Majang. Proceedings of the First National Conference on Ethiopian Studies, R. Pankhurst, Ahmed Zekaria, and Taddese Beyene, eds., 525-534. Addis Ababa: Institute of Ethiopian Studies. 1991. Possessive Markers in Surmic Languages. Proceedings of the 4th Nilo-Saharan Linguistics Colloquium, ed. by M. L. Bender, pp. 91-104. (Nilo-Saharan: Linguistic Analyses and Documentation, vol. 7.) Hamburg: Helmut Buske Verlag. 1991. Reduplication in Majang. Proceedings of the Third Colloquium on Nilo-Saharan Linguistics, Franz Rottland and Lucia Omondi, eds., 239-261. (Nilo-Saharan Linguistic Documentation and Analysis, 6.) Hamburg: Buske. 1990. Linguistic Bibliography of the Non-Semitic Languages of Ethiopia. (Ethiopian Series, Monograph 20.) East Lansing: African Studies Center, Michigan State University and Addis Ababa: Institute of Ethiopian Studies, Addis Ababa University. 1989. An Initial Comparison and Reconstruction of Case Suffixes in Surmic Languages. Journal of Ethiopian Studies 22:97-104. 1989. Selected Aspects of Gumuz Phonology. Proceedings of the Eighth International Conference on Ethiopian Studies, ed. by Taddese Beyene, vol. 2, pp. 617-632. Addis Ababa: Institute of Ethiopian Studies. 1989. Sketch of Majang Syntax. Topics in Nilo-Saharan Linguistics, M. Lionel Bender, ed., pp. 97-127. (Nilo-Saharan: Linguistic Analyses and Documentation vol. 3. Series editor Franz Rottland.) Hamburg: Helmut Buske Verlag. 1989. with Anbessa Tefera. Toward the Classification of Shabo. Topics in Nilo-Saharan Linguistics, M.L. Bender, ed., pp. 405-418. (Nilo-Saharan, vol. 3. Series editor Franz Rottland.) Hamburg: Helmut Buske Verlag. 1988. Majang Nominal Plurals: With Comparative Notes. Studies in African Linguistics 19.1:75-91. 1988. Review of Amharic-English Dictionary by Amsalu Aklilu. Northeast African Studies 10.2/3:193-195. 1988. The Validity and Unity of the Southeast Surma Language Grouping. Northeast African Studies 10.2/3:151-163. 1987. A Typological Anomaly in Some Surma Languages. Studies in African Linguistics 18.357-361. 1986. With Kebbede Hordofa. Book notice of A Grammar of Harar Oromo, by Jonathan Owens. Language 62:951-952. 1986. Word Order Shift in Negative Sentences of Surma Languages. Afrikanistische Arbeitspapiere 5:135-143. Institut für Afrikanistik, University of Cologne. 1986. With Kebbede Hordofa. “Bird Talk” in Oromo. Quaderni di Studi Etiopici 6-7:74-83. 1985. Gumuz: A Dialect Survey. Journal of Ethiopian Studies 18:91-114. 2011 Sacred Name Bible Translations in English: A Fast-Growing Phenomenon. The Bible Translator 6.3: 185-194. 2006. Watch your language! Translating euphemisms. The ATA [American Translators Association] Chronicle 35.2: 35-37. 1998. Semantic Shift on a Geographical Term. The Bible Translator 49.3:323-331. 1996. Teaching the Translation of Euphemisms. Notes on Translation 10.2:35-40. 1996. Review of Translation as Mission by William Smalley. Notes on Translation 10.4:55-59.